Temperatures have dipped, and the chill in the air is suggestive of the holiday season. Why not make the most of it! So, pack your bags and don your explorer’s outfit, for we are taking you for a ride, metaphorically, around Arizona. You may have been there, done that. Or it may be your debut trip. But a comeback trip with friends or extended family only means more fun and adventure. So, are you ready for setting some major travel goals? Fancy taking a trip to The Grand Canyon? The Grand Canyon National Park in north-western Arizona has the distinction of being the 15th site in the United States to have been named a national park. The Grand Canyon was designated a World Heritage Site by UNESCO in 1979. South Rim Tours, North Rim Tours, West Canyon tours, East Canyon Tours, take your pick. Whoa! You may have never expected that there was so much to see & do at the most sited sight-seeing destination in Arizona. Grandcanyon.com conveniently elaborates things to do and see at the place. Be it camping, lodgings, tours, treks, river cruises, all your legwork is done for you. All tours comprise various attractions with travel guides for visitors depending on the time they would like to spend at the place. Each attraction is segmented with an explanation about the tour, length of time as well as an advisory for visitors, logistics and the amount, making it comfortable for tourists to book the tour in advance. Also, it specifically guides you on whether or not any tour is conducive for a family or is it an only-adults venture. As per the official website, it’s open throughout the year and is the most visited section of the Grand Canyon National Park. What more, it’s open throughout the year and can be accessed by all. Neighboring Utah Border, the North Rim side of the Grand Canyon has the reputation of being hard to get to and being quite remote & secluded as it’s quite far from any freeways. Therefore, St George, Utah is the closest airport. North Rim is closed for winter because of snow and is only open from May 15 through to October 15 annually. If you plan to access it from the South Rim, you need to be okay with a 4-hour drive the distance being 200 miles. According to the National Park Service website, the North Rim, also called the “other side” of Grand Canyon gets only 10 percent of major Grand Canyon tourists. It is over 8000 feet or 2438 m in elevation. Main attractions: North Rime Mule Rides, Grand Canyon North Air-Ground (from Las Vegas), Grand Canyon North Air & ATV (from Las Vegas). However, it’s recommended that first-time visitors may visit the South Rim first and plan this side on their next visit to the canyon. West Canyon: A walk to the sky! One Day Whitewater Rafting, Skywalk Glass Bridge, Sightseeing Tours are the known major attractions of West Canyon side. The Skywalk, one of the key crowd-pullers, sits comfortably on the Hualapai Tribal lands. You may choose to drive from Las Vegas if the trip to the South Rim seems to be cumbersome to you. 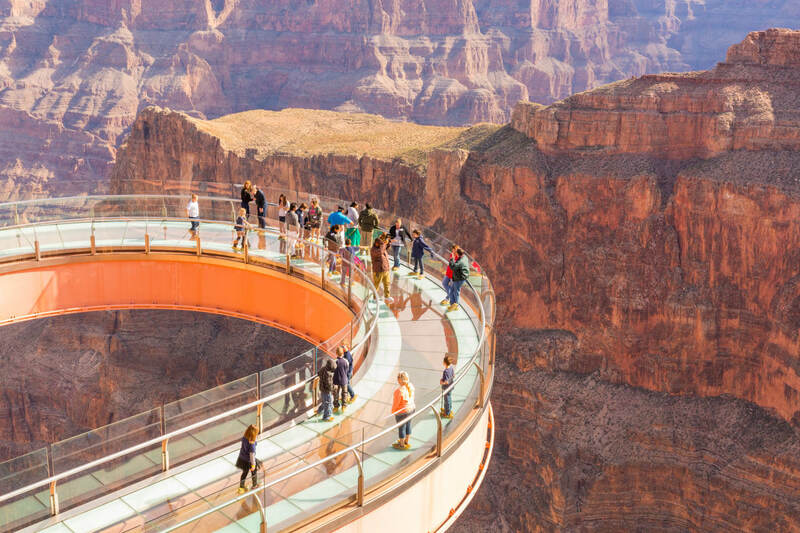 Las Vegas Grand Canyon West tours include Golden Eagle Air Tour, Grand Voyager with Skywalk, West Rim Bus Tour with Skywalk, Skywalk Getaway with Heli & Boat, among others. Multiple visits to Grand Canyon can never be complete without a picture in front of the grand Colorado River that carved out the entire steep-sided canyon. Another must visit location is the Horseshoe Bend, (did some say neigh!). It is located 7 miles upriver from the main Grand Canyon National Park. You may also want to explore the little-known Little Colorado River Tribal Park on the Navajo Nation. It is declared that the Grand Canyon National Park will remain accessible to the public during the partial Government shutdown.